You've probably heard that overweight or obesity creates an increased risk of serious illnesses, such as diabetes, heart disease and even cancer. 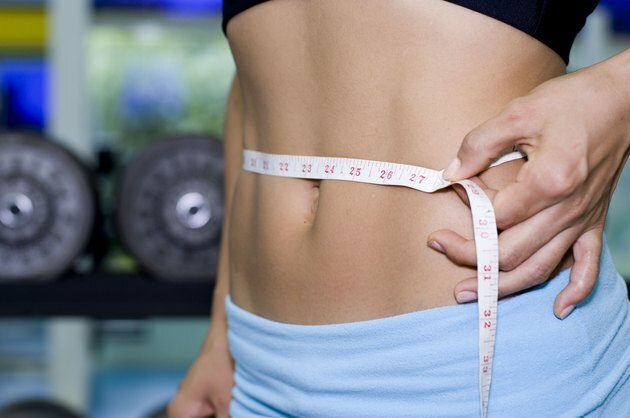 However, there's more than one way to gauge whether or not you're overweight. The Body Mass Index is a popular method of estimating body composition, but there are more accurate ways of measuring your actual percentage of body fat. By any method, however, the average American has too much body fat. Body Mass Index is a calculation derived from an individual's height and weight. Although BMI is not a direct measure of body fat, it's often used because of its simplicity. According to the U.S. Centers for Disease Control and Prevention, a normal BMI falls between 18.5 and 24.9. Lower than that is underweight, and higher is overweight. A BMI of 30.0 or more qualifies as obese. In 2009 to 2010, the average age-adjusted BMI in the United States was 28.7 for both men and women, according to the National Institutes of Health. Based on these figures, the average American is overweight. Unfortunately, however, the BMI doesn't distinguish between fat and lean muscle. For this reason, muscular people sometimes have higher BMIs than poorly muscled individuals who weigh less but have more body fat. An article by Marie-Pierre St-Onge, Ph.D. in "Obesity" and reported by Columbia University, stated that American men with a BMI lower than 25 actually have average body fat of 23 percent. However, according to the American College of Sports Medicine, the healthy range of body fat for an adult male is a lower 10 to 22 percent. For physiological reasons, a woman needs a bare minimum of 12 percent body fat, compared to only 3 percent for a man, according to the American College of Sports Medicine. For good health, a woman needs total body fat between 20 and 32 percent. However, American women with a BMI in the normal or low range average 34 percent body fat, according to the St-Onge study. Like men, even American women with normal BMIs are too fat on average. A low-radiation whole-body X-ray called a DEXA scan is the most accurate way to calculate body fat, according to David Freedman, Ph.D. at the CDC. However, this test is expensive, and many insurance plans won't pay for it. Some health clubs use a cheaper method called bioelectrical impedance analysis, which uses electric signals to compute your percentage of fat and lean muscle. In addition, doctors sometimes calculate body fat from skin thickness measurements over various areas of the body. However the accuracy of these cheaper tests largely depends on the skill of the examiner. Not many Americans have their body fat measured by expensive whole-body X-rays, so actual data from this source is sparse. However, Chaoyang Li and colleagues writing in the "American Journal of Clinical Nutrition," established a baseline for the average body fat of the American population through this method. The authors performed their analysis on a representative sample of adults between 1999 and 2004. They found that body fat in men averaged 28.1, while in women it averaged 40.0. Unfortunately, both the male and female averages exceed the maximum percentage for good health. Columbia University College of Physicians and Surgeons: Are Normal-Weight Americans "Over-Fat?"